Start with a song you've downloaded from the Internet, music services, or extract a song from any music CD. 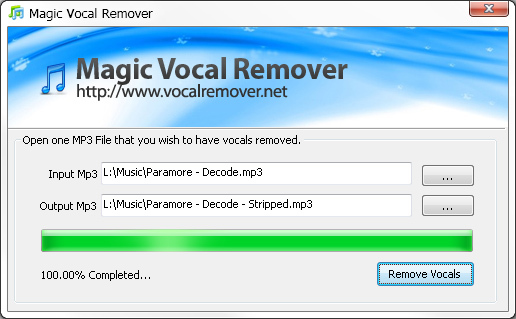 Magic Vocal Remover can reduce or remove vocals from any MP3 songs. Using sophisticated waveform sound inversion software technology, centered vocals without echo will be stripped away, and centered vocals with echo or reverb will be reduced automatically. Any remaining vocals provide a pleasing backup vocal effect. ...... Any remaining vocals provide a pleasing backup vocal effect. Your original recording must be in stereo and vocals need to be in the center of the stereo track; vocals on the left and right sides are not removed. After reduction or elimination of the centered vocals, you can write the music to a new CD, and use it in any karaoke machine, stereo, or portable player. Scan and remove spyware, adware, and other threats on your PC. SpyRemover detects and removes intrusive devices on your system. Qweas is providing links to Magic Vocal Remover 1.0.11 as a courtesy, and makes no representations regarding Magic Vocal Remover or any other applications or any information related thereto. Any questions, complaints or claims regarding this application Magic Vocal Remover 1.0.11 must be directed to the appropriate software vendor. You may click the publisher link of Magic Vocal Remover on the top of this page to get more details about the vendor.